I dock my ship at a nearby space station—with the press of one button, not the careful precision of a surgeon—and go straight to the bar. The bluesy strums of acoustic guitar take me to a familiar space setting as I ask the bartender if there’s anybody he needs “taken care of.” I check the latest galactic news, then head back out into space. As I’m flying warp speed towards my first mission, I’m suddenly pulled to a stop and greeted by nearly a dozen bandit ships. They proceed to lay into me with every laser cannon they have. Rebel Galaxy is the debut project from Double Damage Games, a studio started earlier this year by Runic Games co-founders Travis Baldree and Erich Schaefer. An open world, third-person, space combat game, Rebel Galaxy fills a mostly uninhabited niche in the increasingly popular “spaceships shooting other spaceships while flying around in space” genre. It doesn’t take itself as seriously as sims like Elite: Dangerous or Star Citizen, but still maintains a huge sense of scale and gives the player a lot to do. Limited to horizontal movement, the combat in Rebel Galaxy is frantic but strategic. I often found myself outnumbered and outgunned, relying on my auto-firing turrets and boosters to make sure I only took on a few ships at a time. My main weapon was a laser cannon broadside, meaning my spaceship felt more like a war galleon than an X-Wing. The lack of vertical movement was initially disappointing, but if it were included I think that combat would be too confusing to navigate. There’s already an immense amount of information being expressed through Rebel Galaxy’s impressively minimal UI. With a large number of ships possible in a fight and an even larger solar system—and eventually galaxy—to explore, Double Damage has done a great job making the inherent complexity of space manageable. I was surprised by how intimate it felt to fly around Rebel Galaxy’s humongous solar system. Even at warp speed, it took a few minutes to get to my mission waypoints, but I never went from one place to another without some sort of interesting random encounter along the way. Once, I was attacked by a fleet of outlaws and forced to boost out of range of their gunfire before I could warp to safety. Another time I passed a trader, also going at warp, and slowed slightly to match their speed before we drifted off our separate ways. These experiences were quick but made the solar system feel busy and alive. 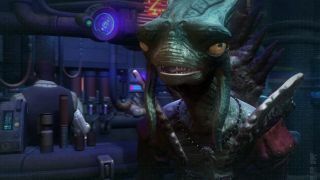 The more I played Rebel Galaxy the more I noticed my discussions with Baldree beginning with “it’s sort of like…” and “this part is kind of similar to…” in a slew of analogies ranging from Assassin’s Creed to Firefly to motorcycle gangs. I almost wanted to apologize; my comparisons felt like I was implying the game seemed unoriginal, but they really meant just the opposite. Rebel Galaxy has a lot of moments and mechanics that feel familiar to those who’ve played other space or ship battle games, but the way all those different mechanics come together mean it’s not quite like any game before it. If anything, it’s most easily compared to Sid Meier’s Pirates!, a game I would definitely not mind seeing more of. I traveled from space station to space station while trading goods, going to the bar for info, and attacking (or avoiding) other ships along the way. While the space setting and trading system are reminiscent of Elite: Dangerous, Rebel Galaxy is no more a space sim than Pirates! is a sailing sim. The focus is on quicker missions in a sandbox world and, over everything else, combat. I played through the beginning of Rebel’s storyline, but nothing was stopping me from running away from it to complete randomly-generated side missions or take on bounties. Even the story missions had an element of procedural generation, and this is where I found my main concern with Rebel Galaxy. The version I played was an early one, but I could see the experience wearing thin quickly without the addition of more varied missions and modes. One of the things that made Pirates! such a lasting experience was how much it had to do outside of sailing from port to port. Its minigames, swordfighting, and other small distractions weren’t the highlight of the game, but they were refreshing breaks from sailing and broke up the pace. Rebel Galaxy has opted to try for variation and breadth of content within the battles themselves over distinct game modes—a choice that could very well work out, even if my experience with it didn't fully communicate how. Considering Double Damage has such a small team, the amount of detail and content already in this early build—including the fantastic soundtrack which Baldree described as “bikers in space”—is absolutely impressive. Rebel Galaxy doesn’t yet have a release date, though Baldree told me he’s aiming for 2015. I hope he takes his time to really flesh out everything the player can do. As it stands now, Rebel Galaxy is already a unique entry into a rapidly re-emerging genre.